A priest and an imam walk into a bar… or in this case sit down for tea. Amazon Prime released a new ad – just in time for both the end of a vicious presidential election and the start of the holiday season – that tackles the issue of “otherness” head on. Thanks at least in part to Donald Trump and the alt-right’s increased hostility to Muslims in the last year or so, Islamophobic aggression and hate crimes are on the rise in the U.S. and across Europe. So in a political climate that can often feel like Western and Eastern worlds are pitted against each other, Amazon’s ad team decided to tell a story of unity and inclusiveness. In the ad, Rev. Gary Bradley and Imam Zubeir Hassam – two real religious leaders from the U.K. – share a cup of tea, and realize they suffer from the same problem. Both of the aging men take a seat in the reverend’s living room, and as they fall into their chairs, they both grab their knees and wince. The two exchange glances, share a laugh and a pleasant conversation. As soon as they finish their tea, they go to stand, both still wincing at the pain in their knees. They say great minds think alike – and this moment gives both men the same surprise gift idea – knee braces. After the imam leaves the reverend’s house, each man whips out their smart phone, and buys the other a set of padded knee braces. We then see each of the religious leaders put their gifts to use, as they enter their respective houses of worship, get on their knees and pray. Both Rev. Gary Bradley and Imam Zubeir Hassam are not professional actors – but they are real faith leaders in their communities. 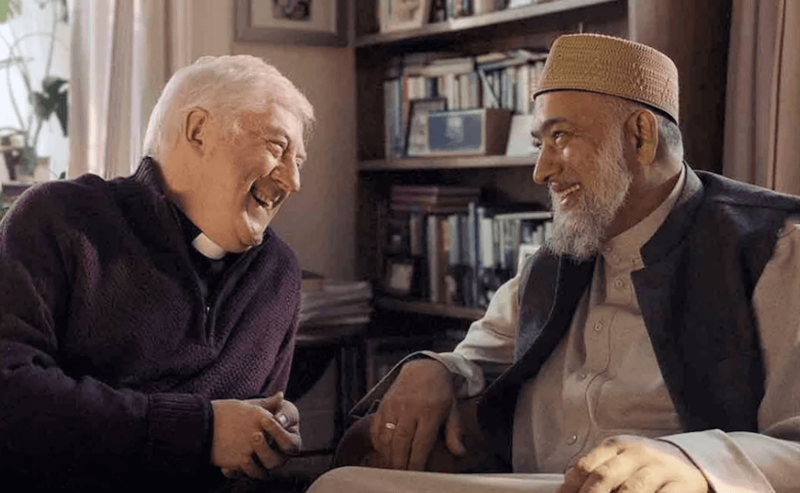 The Telegraph reported that the filmmakers behind Amazon’s ad first consulted with the Church of England and the Muslim Council of Great Britain, and also the interfaith Christian Muslim Forum before shooting the ad, to respect the faiths and the authenticity of the ad. Maybe we can all take more than just religious advice from our faith leaders.